Hi loves! How are you today? I am writing this post in advance because today I am having fun at a bachelorette party from a dear friend. We went to a beer museum/brewery thingie and played around with crossbows. At this time we are probably on our way to the city for drinks and dancing! 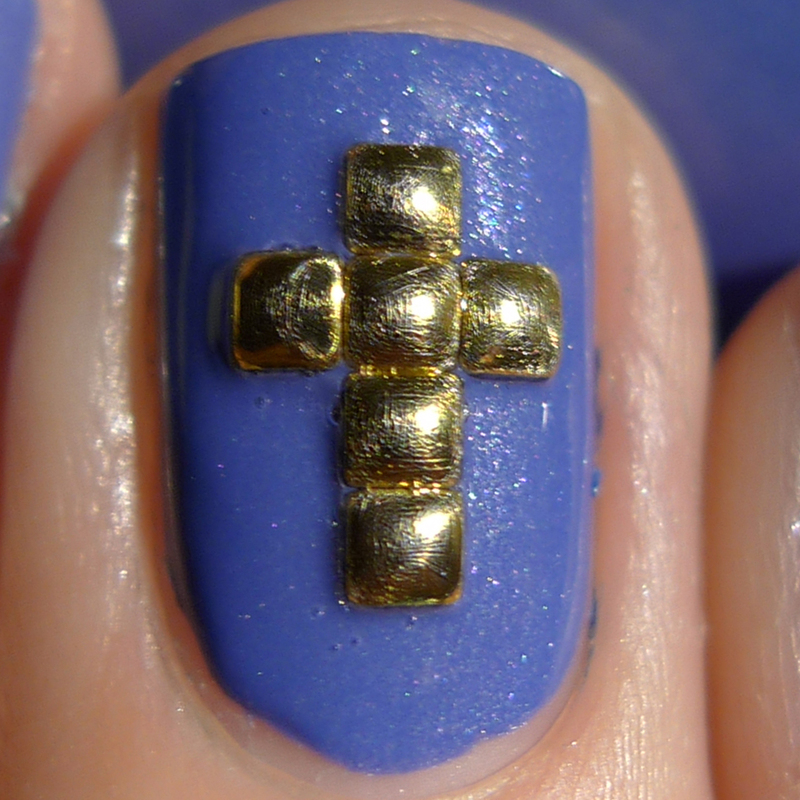 Now, for today's polish: I have shown it a bit before but not on it's own. It's the light base in this gradient! But, I realized it is too pretty to not show you without (too much) decoration so I have busted it out again. 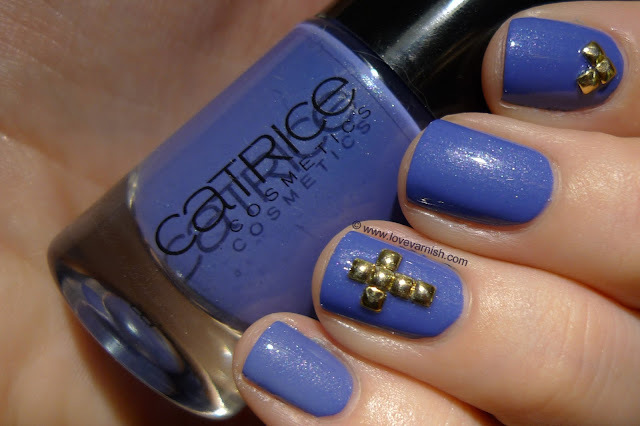 Catrice Denim Moore was released earlier this year and it is a beautiful blue periwinkle, but there is a hint of purple in it too. It has a gorgeous shimmer that isn't overpowering (making it look like a giftwrap ribbon) but shows very easily. I used 2 coats to apply this and besides the awful brushes now present in the Catrice bottles (they are all crooked) it applied flawless. Very buttery and smooth. Because I am now officially obsessed with the golden studs I showed you here before I wanted to use some to spice things up. I picked 3 for my index and 6 for my ringfinger. I created a V shape and a little cross with them. The golden studs can be purchased at Born Pretty Store, use the code DELJ61 for a 10% discount. Tell me, do you like this polish? And what shape would you create with the studs? This color is awesome! I have it myself but the brush is AWFUL. Love the golden studs! Such a pretty color! And I LOVE the square studs! I need to get me some! Thanks Gwen, this one had actually quite a nice brush compared to some other bottles..
Ooh, love both ideas! Have to memorize this haha. Yes yes yes, the studs are EVERYTHING. Why didn't I pick it up? O.o it's so lovely...I cannot resist to any shimmer. Save me!